A classic title from M.C. 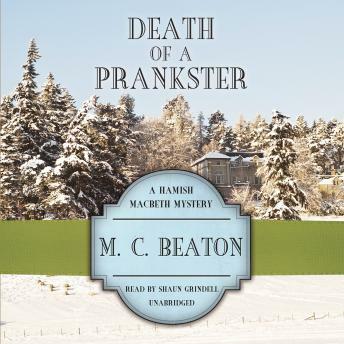 Beaton’s New York Times bestselling Hamish Macbeth series about the death of a practical joker. Admittedly, there’s a touch of black humor in the case. Rich, old practical joker Andrew Trent summons his kin to the remote Arrat House in the dead of winter for a deathbed farewell. They arrive to find him in perfect health and eager to torment them with a new bag of unfunny jokes. But this time the body that falls out of the closet is Andrew Trent’s own. And nobody’s laughing. Especially not Constable Hamish Macbeth, who is hard put to glean any information from Trent’s unappealing nearest and dearest. And when the lanky constable’s former flame Priscilla Halburton-Smythe inserts her beautiful self into the case, Hamish must muster all his native guile to carry him through. Fortunately, he has a few clever tricks up his own sleeve which enable this most endearing of crime fighters to get the best—and last—laugh.